Long after the Christian worker’s personal words — or the Tribal Trails TV guest’s testimony — have faded, a piece of literature or a DVD may remain, providing a reminder and a portion of Scripture that speaks to the heart. We believe that culturally relevant and biblically-based tracts, books, videos and audio recordings can have an effective role in evangelism and discipleship among Native people. Our Printshop produces many of these materials, and some of our missionaries operate their own bookstores in several Native communities. We distribute Bibles and literature produced by sister organizations — in English and Native languages — which we believe not only assist our own church planting missionaries, but many other North Americans who are also involved in ministry to First Peoples. 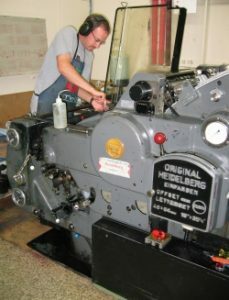 Our Printshop, located at our Headquarters in Prince Albert, handles much of Mission’s printing needs — with larger volume projects currently being printed commercially. Besides printing, we are also involved in the production and distribution of CDs, DVDs (most notably the JESUS Movie), and other audio & video recordings especially for First Nations audiences.